Home / Movie News / Pawan Kalyan / Ram Charan / Pawan-Charan Movie is not happening!! Pawan-Charan Movie is not happening!! Contrary to rumours that Pawan Kalyan and Ram Charan would team up for a multi-starrer to be directed by Trivikram Srinivas and produced by Bhagavan Pullarao, it is learnt that the movie is not happening. 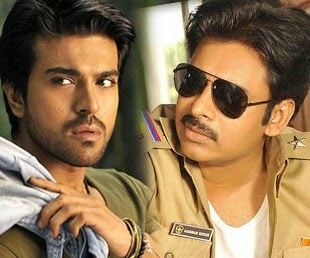 Sources close to Pawan made it clear that Pawan and Charan doing a film together would be out of question. It's not that Pawan Kalyan is against to the idea but even Ram Charan has few reservations that Pawan might overshadow him. Although Charan has great liking towards his Babayi Pawan Kalyan and even stated this publicly on several occasions, but teaming up in profession has many equations. Charan may not gain professionally by sharing screen space with his Baabayi and in turn he may lose out to Pawan. Few combinations should seem good on paper and in news but practically there involves a slew of hassles for multi-starrers, says an industry source. Meanwhile, many upcoming multi-starrers are under various stages of production. While Pawan-Venky's Gopala Gopala is due for release, Nag-Karthi movie, Allari Naresh-Vishnu film, Venkatesh-Ravi Teja, Siddharth-Naga Chaitanya-Aarya (Bangalore Days remake) are on cards. But we hear that Pawan-Charan movie is out of it. So for mega fans who are desperate to watch both Baabayi and Abbayi on screen, it's disappointing.